I'm still trying to catch up with the Christmas knitting report. But first, a giant thank you for all the recent love and support you've sent my way. You'll never know how much it's been appreciated. Christmas Day is my mom's death anniversary and as much as I've always loved the holiday, I struggle with it now. And December was just comically bad. We definitely experienced a Murphy's Law December. And then starting 2019 off with the loss of Minnie... I haven't been in the best place, but your support and thoughtfulness have kept me going. And I thank you! I also apologize for all the whining I've been doing. But mostly, I thank you. My Christmas Eve Cast On project was Easy Ragland from The Green Mountain Spinnery Knitting Book. The sweater's name says it all! It's truly an easy ragland pattern that I've knit... gosh, probably 15 times. I got home from my December 23rd shift in the wee hours of Christmas Eve morning and knew that if I was going to get something cast on on Christmas Eve, it must be cast on then. So, around 5:00 a.m., I started knitting. If I had it to do over, I'd have chosen 1) a different ragland increase, 2) a different accent design, and 3) a different color yarn for said accent. I didn't try the sweater on, or really even pay that much attention to my modification until I'd already knit more than half the body. My mods aren't Horrible but they aren't great. 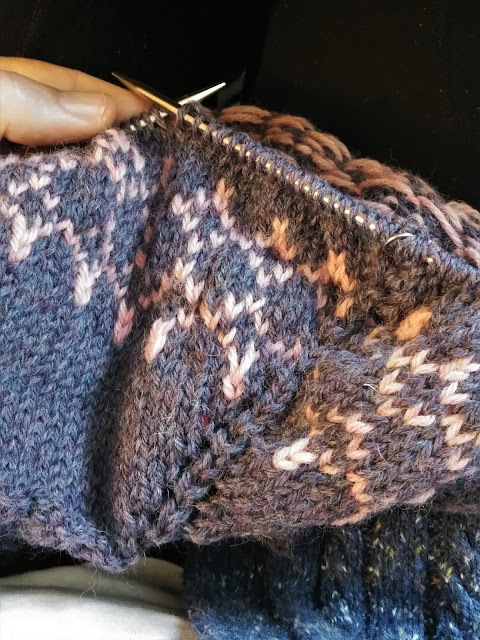 I followed the written pattern for the ragland increases and they break up the color work. Instead of being rounded, the design came out squared. And I probably should have knit two repeats of the design instead of one but.... And the pink.... as pinks go, I love the Blossom Heather colorway and it looks good with the purpley Mineral Heather but... it's kinda a little too girly for me. I just keep thinking, am I really going to wear a pink and purple sweater? But like I said, it's not Horrible so yeah, I will wear it. And feel like I'm a 12 year old girl when I do. Lovely sweater! Keeping busy is the key to gaining some balance after so many losses. I still struggle everyday to find some joy. Some days I win. Some days I don't. I lost my grandmother on Christmas Day in 1989 and I've yet to make peace with the season. It really is a hard time of year for those who are grieving. Very pretty! I like the combination and admire that you can just change a pattern to be something else. I am sorry for December/January being challenging with your past loss and recent loss, I'm sending prayers your way . Love the knitting and the catch up!